It’s important for a web application to serve end-user requests as fast as possible. A good rule of thumb is to avoid web requests which run longer than 500ms. If you find that your app has requests that take one, two, or more seconds to complete, then you should consider using a background job instead. For a more in-depth understanding of this architectural pattern read the Worker Dynos, Background Jobs and Queueing article. This can be even more important for Node.js servers where computationally expensive requests can block the Event Loop and prevent the server from responding to any new requests until the computation is complete. Separating this computation out into a different process keeps your web server light and responsive. This article demonstrates using worker queues to accomplish this goal with a sample Node.js application using Bull to manage the queue of background jobs. The web process serves the index.html and client.js files which implement a simplified example of a frontend interface that kicks off new jobs and checks in on them. Generally you would not give clients direct access to kicking off background jobs like this, but this is kept simple for demonstration purposes. worker.js spins up a cluster of worker processes using throng. In this example the job simply sleeps for a bit before resolving, but this should be a good starting point for writing your own workers. Each worker is a standalone Node.js process with an independent Event Loop. On Heroku dynos a default value for this is set for you in the WEB_CONCURRENCY environment variable. This will scale based on the amount of memory on the dyno, but may need to be tuned for the characteristics of your specific application. Read Optimizing Node.js Application Concurrency to learn more. Each worker is picking jobs off of the Redis queue and processing them. This setting controls how many jobs each worker will attempt to process at once. This will likely need to be tuned for your application. If each job is mostly waiting on network responses, like an external API or service, it can likely be much higher. If each job is CPU intensive, it might need to be as low as 1. In this case we recommend trying to spin up more worker processes. client.js implements a tiny web frontend that allows you to kick off jobs and watch them process. 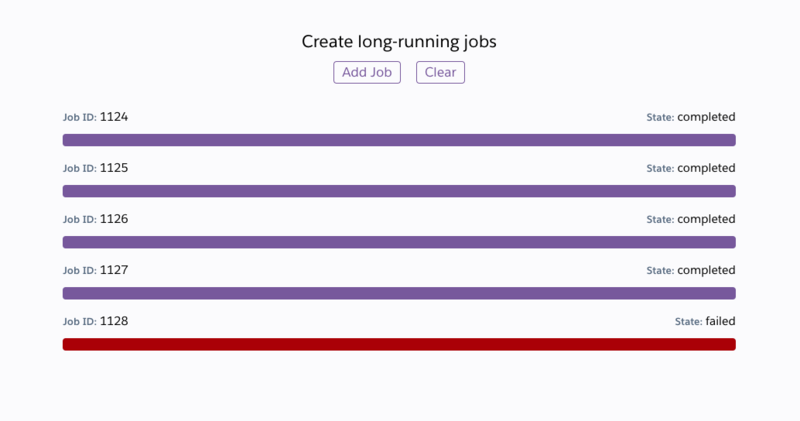 In production Bull recommends several official UI’s that can be used to monitor the state of your job queue. For more information on using these features see the Bull documentation.